I like the above quote and although I’m nowhere near saintly enough to stick to it, it’s worth aspiring to. And I do try to remember that everyone faces a bit of a struggle – to a greater or lesser extent – and nobody has a perfect life, no matter what kind of face they present to the world. So I try to not to waste energy feeling resentment, envy, disappointment or annoyance with my fellow travellers through daily life. But it’s the faceless ones – commercial organisations and bureaucracies – that I find it very hard not to get worked up about and, when faced with inefficiency and indifference on their part, I’m afraid the ranting red mist descends. Yes there’s a rant coming on. Normally Rant & Rave Tuesday is the second Tuesday of the month but I’m afraid I didn’t post last week as I was busy being a domestic goddess and taking up curtains and hanging pictures. So this week’s blog is a combination of R&R and my normal third Tuesday content of book review and blog of the month. The Rant – We moved house recently so we’ve been buying bits and bobs for the new place. First problem was companies who can’t/ won’t deliver to the Scottish islands. One UK company told me that they don’t do international deliveries! That rendered me speechless – especially as our island is joined to the mainland by a toll free road bridge. Then, two furniture items in succession arrived without the correct components for assembly. One – a home cinema system arrived with no screws. Neither manufacturer nor supplier was willing to send the missing items. My husband had to trawl the internet and managed to source a set of the necessary fixings from the USA. The other item – a stand for the TV – came with bolts that were too short to attach the TV to the stand. Again it was down to us as the customers to sort this out and find the right bolts from elsewhere. Next – was the saga of trying to get our electricity supplier to set me up to pay online – what a palaver – days of emailing Gary in customer in customer services. He feels like one of the family now and I’m sure the poor guy has developed a twitch and the need for tranquilising medication. It’s a sair fecht at times. But on The Rave side – Plusnet – our broadband provider have proved efficient, communicative and reliable – and our satellite TV installer, Mario was also brilliant. And the local plumber also turned up trumps when our boiler sprung a leak. Hurrah for them. 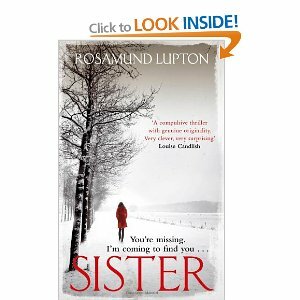 Book Review – just a mini one this time – I’ve just finished ‘Sister’ by Rosamund Lupton (published by Piatkus and available on Amazon as paperback and ebook). A friend lent it to me suspecting it was my sort of read. And she was right. This is a great suspenseful thriller. Beatrice goes in search of her missing sister. As she searches she finds out that there was a lot she didn’t know about her sister and Beatrice ends up in terrible danger. It’s scary, moving and will have you reading way past lights out time. My only reservation – not entirely satisfied by the ending – but I still felt it was worth it for the journey. 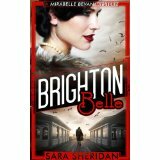 Next month I will review Sara Sheridan’s soon to be published new novel ‘Brighton Belle’ (to bepublished by Polygon in hardback in April and paperback in July) – sneak preview – it’s a good one. And finally – congratulations to another twitter writing buddy Mr Fletcher Moss (@FletcherMoss ). His children’s novel ‘Sleepwell and Fly’ (aka ‘The Poison Boys’) has just been announced as the winner of the 2012 Times/Chicken House Children’s Writing Competition. It will be published next year. He blogs beautifully at http://sleepwellandfly.blogspot.com Nice one Mr M.
Hi Arlynn, I hope you enjoy the book and thanks for dropping by 🙂 I’m still enjoying your posts and hope you are feeling well again. Anne, what a lovely surprise before I go to bed to see I am your blog of the month,Thank you so much I am very flattered. I have to live up to it now. I like your quote from Dickens I will have to write it down it’s a good one to live to. You are so right about frustrations, why do the binmen never come when they’re due to and bins are left for days contents blowing in the wind.Grrrhh!! Hello Anne – just wanted to pop in and say hello. Always enjoy the blog; thanks so much for your kind words!